None of these raise a red flag? | Mothers Against Wind Turbines Inc.
None of these raise a red flag? When you finish reading these comments and events of the past several months concerning wind turbines, ask yourself, “Don’t any of these issues raise a red flag?” If you feel that most, many or even just some of these raise red flags, then why would the present Almer and Ellington Township Board officials even consider installing 500’ tall wind turbines so close to our homes without more research? Wind lease owners must sign a confidentiality agreement whereby they can’t be critical of NextEra. Why are they required to sign a gag order? What would you think about a doctor who requires you to sign a “gag” order before surgery? Almer Twp. Board and planning commission (PC) member, Brian Schriber, commented in last week’s Advertiser, “I resent the claims that residents feel they are not being listened to.” This is very disingenuous and deceitful considering he made a motion at the July 13 PC meeting to ignore long time Board member, Patty Witkovsky, and every other citizen who spoke during 35 minutes of public comment. Schriber made a motion before any PC members had a chance to discuss possible changes to the wind ordinance. He wanted the wind ordinance passed “as is” without any of the additional changes suggested just seconds earlier by residents. Former township official, Art Graff, read eight items at a PC meeting that township officials removed from the present wind ordinance. This is just one of the lines that was inexplicably eliminated: “The tower shall not be unreasonably injurious to the safety or market value of nearby properties.” At three Almer Township meetings, PC Chairman Bob Braem said, “I ‘think’ some of those items were put back in the new ordinance.” He “thinks” they were put back in? When asked where they specifically appear in the new ordinance, he didn’t, couldn’t or wouldn’t produce proof. Mr. Braem also decided to hold a meeting in a snowstorm/blizzard that many residents were not able to attend. He evidently also thought Almer Township residents would be adequately informed of a surprise special PC meeting if he simply had a note posted on the township door 18 hours in advance of the meeting. Mr. Braem also has not included residents in “discussions” at several PC meetings dominated by NextEra, Spicer (the engineering firm) and the township attorney. Being pro-wind does not give him authority to ignore residents. Mistake or a lie? NextEra official, Mark Trumbauer, said at an Ellington Township meeting that “55 decibels is not loud. After all, the county allows 65 decibels.” Tuscola County doesn’t have any wind turbine sound specifications. Mistake or lie? When NextEra was asked at a surprise special PC meeting about the number of turbines and locations, a rep said he could “honestly say he didn’t know”. The very next day NextEra’s map of possible wind turbine locations appeared on an FAA website. Mistake or lie? In late March, Duane Lockwood (Ellington Township Supervisor) was still saying they would not place turbines south of M-81. In mid-March, NextEra had submitted to the FAA a map showing SEVEN turbines installed south of M-81 (including three on the Supervisor’s land). Mistake or Lie? Ryan Pumford, another NextEra spokesperson has said on numerous occasions that there have been only three “accidents” involving their wind farms. However, an Ellington Township resident personally viewed two NextEra turbine accidents while on vacation in Colorado and found examples of four other NextEra turbine accidents online. In one breath, NextEra claims there are very few turbine failures and in the next breath, they say how a design was changed because of problems. One Gilford Twp. official said the biggest issue they’ve faced has been that NextEra has failed to live up to their financial tax promises. Several farmers have complained some drain tiles have been crushed and land is severely compacted that takes years to resolve. Some areas have been repaired, but one doesn’t know about the damage until later and then it’s hard to prove the cause of compaction. Have our township officials even discussed soil compaction? Gilford Twp. officials confirm shadow flicker is an issue, including one Board member who had to make adjustments to her house to cope with the annoyance. Our officials dismiss shadow flicker as insignificant. NextEra spokesperson, Mark Trumbauer, says, “It is clear a small, vocal group of wind energy opponents intend to create delay at every point…” Almost a dozen area townships have passed moratoriums or referendums. Almost a dozen townships? That is no small group! Almer Board members, Brian Schriber and Charlie Dennis, say they’ve been bombarded with so many people pressuring officials. Which comment should you believe? Mark Trumbauer’s “small group” comment or the Schriber/Dennis “bombardment” comment? 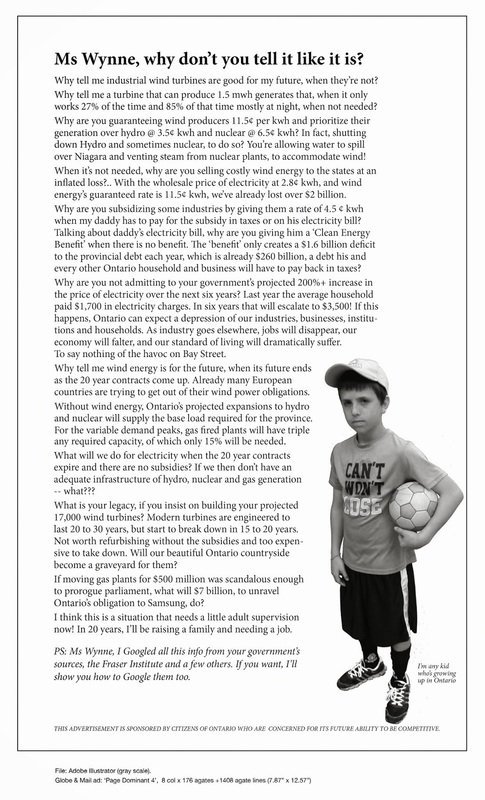 Citizens are worried about the cost of decommissioning/dismantling turbines (estimated today at $200,000 per turbine) at the end of their life span. Mr. Schriber thinks he can take down a 500’ turbine by himself. Not to be outdone, Charlie Dennis said someone could take down a turbine with a few sticks of dynamite. Township officials have often ignored the fact that approximately 25% of people are annoyed or highly annoyed by the wind turbines. However, Health Canada and the non-participating land owners who are annoyed by turbines admit turbine noise and vibration may not be sensed unless people are subjected to the turbines for an extended period of time. Visiting a turbine for a few hours, as township officials have done, is a waste of time. According to research by Ellington resident and engineer, Eric Zbytowski, complaints from people subjected to noise from a turbine drop off significantly if the turbine is more than 2000’ away. Yet, township officials dismiss that research as they have dismissed so many other issues. NextEra claims that a GE turbine safety manual is not available for distribution. No township official has balked at that claim? NextEra states “research” proves home property values don’t suffer. Wind energy companies use “research” that examines home values five to ten miles from turbines. Does NextEra use a survey of homes 2000’ away or less from a turbine? Of course not. Research from the Minnesota Department of Health: a minimum setback distance of 2,640 ft. from the home is necessary to not suffer the health consequences of low frequency noise generated by the turbines. Ellington Twp’s proposed ordinance IS HALF THAT DISTANCE at 1320 ft. Almer Township’s setback from the home is three times the 499 ft turbine height which makes that distance less than 1500 ft.
An incredible comment was made by Ellington Township PC AND Board member, Joddy Ehrenberg at a PC meeting: “The trees block most of the sound from the turbines.” Trees? What trees? Does everyone in the township have trees tall enough and dense enough to block the sound of the turbines? And no one else on the Ellington PC questioned that comment? Officials’ lack of transparency has been trending for years. There was a totally different conflict of interest issue beginning in 2014 whereby the Almer Township PC Chairman had to resign. In October of 2014, the PC tried to rezone an area “quietly” without properly informing citizens. They ignored the pleas of a packed township hall several times in 2014 over that conflict of interest just as they have ignored the wind turbine conflict of inters today. The officials will deny this – just ask them. And, lastly, here is an example of Ellington AND Almer Township officials’ lack of openness. They have posted special meeting “notices” on the township door several times over the last few years a little over 18 hours before the meeting. If officials were truly interested in our concerns, they’d give someone a “heads up” call. Their 18 hour notice forces residents to check the door of the hall twice a day, every day, 356 days a year. If wind turbines were placed safely away from people who haven’t signed wind leases, residents wouldn’t be challenging this project. Many of our township officials have continuously dismissed, discounted, distorted, deflected and denied residents’ concerns for months. These issues listed above certainly raise red flags! You can help change that at the upcoming primary election on August 2nd. This primary election on Tuesday is more important for our townships than the November 4 general election. Thanks for this examples of sheer neglect to protect residents who did not consent to having turbines sited so close to their homes. Here’s one from Ashfield Colborne Wawanosh in Huron County, Ontario where a Councillor who had received hundreds of emails from residents who had copied her on emails which were sent to all who are responsible for the distress turbines were causing since they had been turned in spring of 2015. She openly stated at a meeting where a decision of whether or not to declare ACW an ‘unwilling host’ in the future, that the thing she loved so much about being a Canadian citizen was our democracy and how it allowed and compelled her to vote against this declaration and support the leaseholders in the municipality. Those of us who were in attendance and well aware of the adverse health impacts caused by noise, low frequency sound modulations and infrasound radiation were stunned! We were not allowed to speak. ‘Democracy’ gave her the ‘freedom’, as an elected Councillor, to continue to harm even more residents who, against their will, will have turbines and infrastructure sited too close to their homes!